Running or exercising in worn out shoes will lead to an increase in the rate of occurrence for foot, knee and hip injuries. Over a short period of time athletic shoes can lose their functionality and their ability to protect your feet. Worn out shoes and foot pain go hand and hand. They will create an opportunity for injuries such as, Plantar Fasciitis, Achilles’ Tendonitis and knee pain. 1. Outsole – designed to provide traction. 2. Midsole – designed to provide shock abortion. 3. Heel counter – designed to control the position of the heel. 4. Insole – designed to support the arch, absorb shock and disperse the impact or weight load. 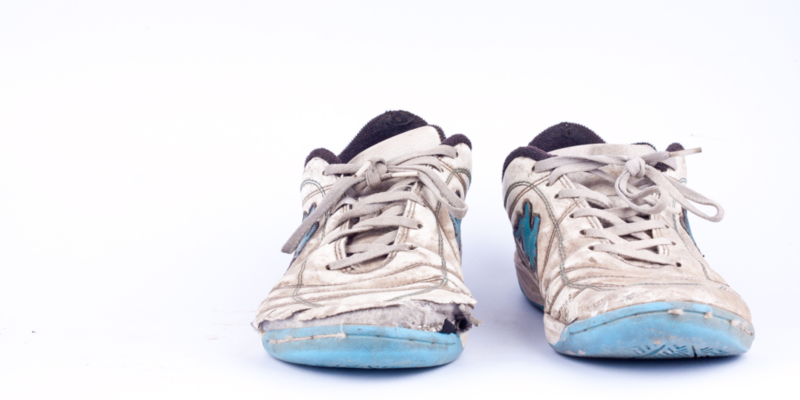 Most shoes will start to show some wear and tear at around the 200-mile mark if you are a runner. Check the outsoles on the shoes to make sure the heel and forefoot are not wearing thin. If they are worn down this will cause your foot to pronate or supinate a few degrees more putting your feet, ankles and knees at risk for injury. Next check the midsoles of the shoes. Is the midsole wrinkled or compressed? If so this is a sign the shoes are not performing by absorbing the high shock forces that you are exerting on them. This will lead to excessive shock forces being returned to foot, ankle and knees. Next, check the heel counter of the shoe. You can do this by placing the on a flat surface at eye level and looking at the back of the shoe. Notice the way this shoe is tilting in the picture. It is leaning about 2 degrees to the inside, which will increase pronation and possibly cause foot or knee pain. The last thing to check for is the wear and tear on the insole of the shoe. To do this you can simply use your fingers to feel in side the shoe. 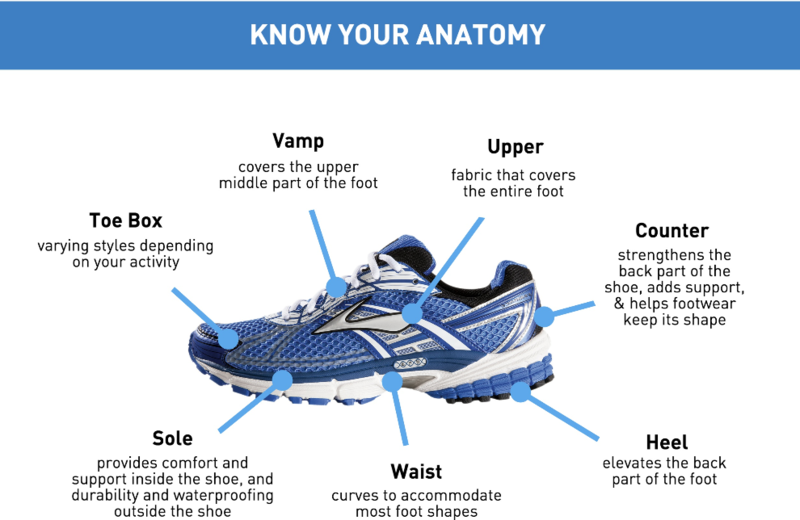 If you feel indentation around the metatarsal heads (ball of the foot), in the toe box or at the heel of the shoe it may be time to replace the insoles. Mileage – If you run on a regular basis try to keep track of the mileage on the shoe. Most people of normal weight and gait should get about 400 miles out a pair of shoes. If you are heavier you may only get as little as 250 miles out of a pair of shoes. Rotating shoes – When you find a model of a shoe that you like, buy a second pair. Wait until you have about 100 miles on the original pair. Now begin to rotate the shoes on every other run. This will keep your feet happier and you will notice when the older pair is at the end of its lifespan. Do not buy shoes just by their size! Just like clothing, no two shoe manufacturers have the same specs for a size 10. If you think you are a size 10 try on a 9 ½, 10 and a 10 ½. It will only take you a couple of minutes and you will always end up with the correct size shoe!